I’m not going to lie to you – I’m a pretty lazy person. I have no patience, I don’t want to wait for my dinner to simmer properly, I don’t wait until a cupcake is completely cool before I ice it, and generally nuke the butter in the microwave first when I am baking so that it mixes it pretty instantly. It’s probably the worst character flaw I have it, along with falling down all the time. 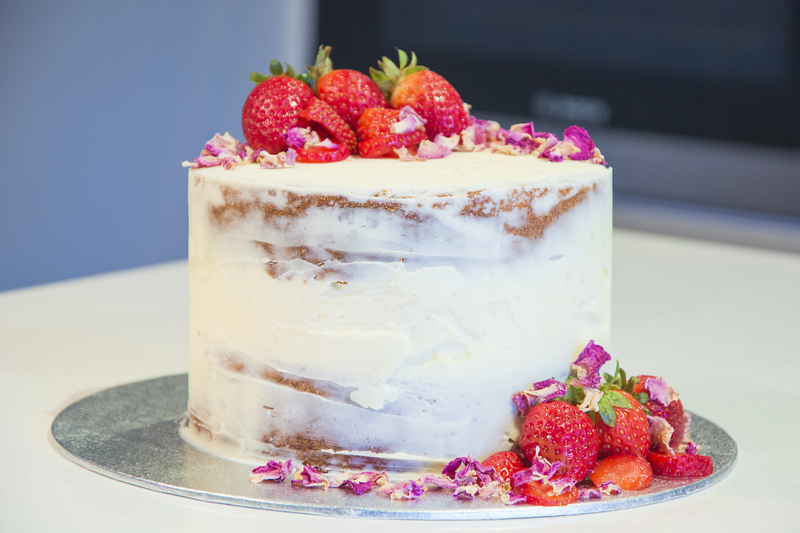 You’ve no doubt heard about the current trend that is sweeping the baking nation – that of the naked cake. A naked cake is a cake that has forgone the icing or buttercream that generally covers a cake and puts the layers of the cake on display instead – and boy are there layers! Naked cakes are a combination of layered cream, buttercream, berries or delicious surprise pieces that showcase the cake in all of it’s glory. This trend has moved on a bit to one that does get mistaken as a naked cake, but is more defined as a “semi-naked cake” or my favourite term, a “scantily-clad cake”. This cake has been iced with buttercream, but has been scraped so that pieces of the cake show through. It is generally adorned with flowers or floral elements, and has a very natural rustic look to it – making it very popular with the current industrial style weddings and events that are commonplace nowadays. I decided to shake myself out of my laziness and give this scantily-clad cake a try, and I am so proud of my results that I think it has to be one of the best cakes I have ever made to date! Before I started I researched and studied different ways to make these semi-naked cakes, and the video I found the most helpful was 100 Layer Cake’s, which I have featured on the blog before in Party Round Up: June. I made two vanilla cakes, which you can make using your favourite cake recipe and baking the amount of cakes as the layers that you want in the cake. Cut the tops off of the cakes so that they are level and then make the buttercream. I found my new favourite one on the blog The First Year and it is super simple to make. In a mixing bowl, combine the butter and Copha, and beat using an electric mixer until fluffy. I had difficulty with this as the Copha was extremely hard, so make sure it is at room temperature or slightly melty before mixing together. Add in vanilla extract and gently mix by hand with a spatula. Begin to add the powdered sugar, gradually and mix by hand. Continue adding powdered sugar until the frosting no longer looks wet and tastes good to you. Once you have made all of the items, it’s time to put them together. I used the buttercream around the outside before spreading strawberry jam on the inside of the buttercream barrier and onto the cake itself. Then I whipped my own cream (I’ve never done that before – look at me go!) and poured that on top before putting the second layer of the cake upside down on top. Then I put it in the fridge to firm up a bit before pulling it out and spreading the icing around it. The buttercream actually stuck really well so that I could have actually not made a semi-naked cake and could have iced it completely, but I went back around and scraped it off in parts to give it that rustic look. 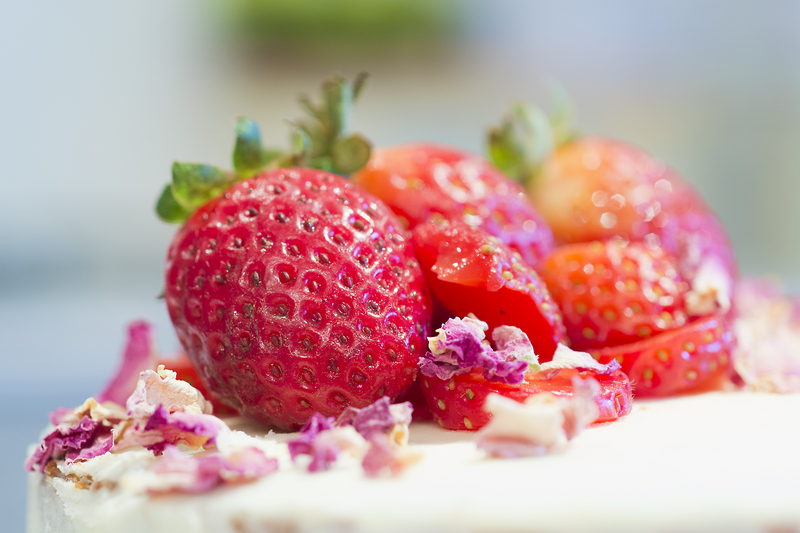 Once I was all done, I put some leftover strawberries on top, and sprinkled some edible rose petals on top as well. Viola! I made one of the most perfect cakes I think I will ever made, and I am so ecstatic about it that I had to share it with you! Let me know what you think of my most proudest creation in the comment section below, and be prepared to find more of these beauties on the blog soon!